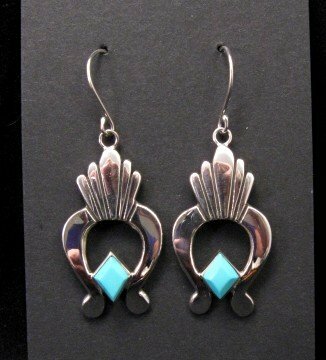 Elegant Native American turquoise sterling silver dangle earrings, hand made by Navajo Dine silversmith, Ronnie Henry. Natural Kingman turquoise. 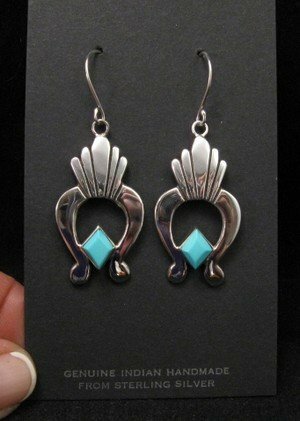 Ronnie Henry is an accomplished Navajo jeweler. His style has evolved over the years and now is very contemporary. The earrings measures 1-3/8 long, not counting the french hooks, by 3/4 wide. Each earring weighs about 5.5 grams. Please ignore the reflections showing in the sparkling sterling silver. It was difficult to take a picture of the earrings straight-on because of the reflective nature of the silver. Brand new in perfect condition. Stamped sterling and hallmarked by the artist. Certificate of Authenticity included and gift box included. Ronnie Henry was born in 1960 and has been active silversmithing since 1975. He is the son of jeweler and weaver Louise Henry and brother of Ernie Henry, who was also his teacher. 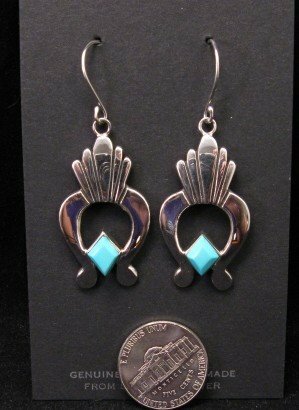 The crescent shaped naja is one of the most familiar forms in Navajo indian jewelry. It clearly comes from outside the Navajo culture. It is thought to have originated in the Old World as a Spanish horse gear - a third eye placed on the animals forehead to ward off evil. It is often used as a focus piece in " squash blossoms " are actually pomegranate blossoms that were worn as trouser decorations by Spanish Colonial gentleman.